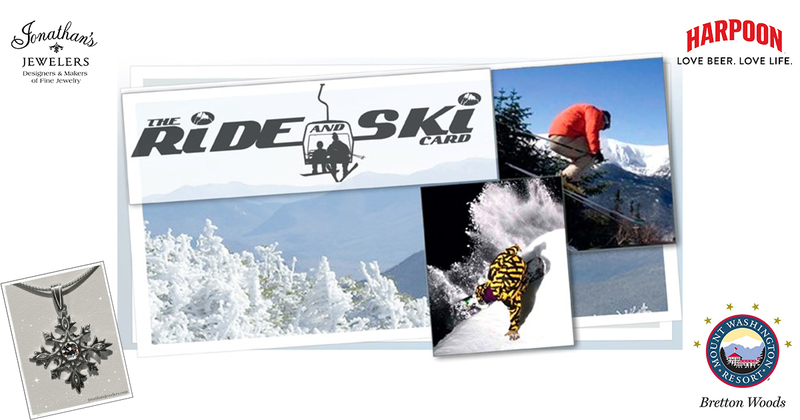 Join the Ride & Ski Card New England, Jonathan’s Jewelers and the River at Bretton Woods, Saturday February 10th. Bretton Woods is consistently voted Best Snow & Grooming in the East by readers of Ski Magazine. Plus, Ride N Ski Card holders can purchase discounted lift tickets that day for just $69 when you show the Ride & Ski Card! After a day on the slopes join us for a fun-filled Harpoon Brewery Après-Ski Party in the Slopeside Pub from 2-5 PM with Live Music by Palmer Egan and loads of fun, games and prize giveaways… where one lucky person will win a beautiful sterling silver & diamond Snowflake pendant valued at over $700 courtesy of Jonathan’s Jewelers – Designers & Makers of Fine Jewelry in Bedford, NH.